The daughter of a distinguished soldier' Bess Crawford follows in his footsteps and signs up to go overseas as a nurse during the Great War' helping to deal with the many wounded. There' serving on a hospital ship' she makes a promise to a dying young lieutenant to take a message to his brother' Jonathan Graham: "Tell Jonathan that I lied. I did it for Mother′s sake. But it has to be set right." Later' when her ship is sunk by a mine and she′s sidelined by a broken arm' Bess returns home to England' determined to fulfill her promise. It′s not so easy' however. She travels to the village in Kent where the Grahams live and passes on to Jonathan his brother′s plea. Oddly' neither Jonathan' his mother' nor his younger brother admit to knowing what the message means. Then Bess learns that there′s another brother' incarcerated in a lunatic asylum since the age of 14 when he was accused of brutally murdering a housemaid. Bess rightly guesses that the dying soldier′s last words had something to do with the fourth brother. Because the family seems unwilling to do anything' she decides that she will investigate. It′s her own duty to the dead. I had never heard about this series, but Jen at Devourer of Books posted about a read-along that was being hosted by Book Club Girl. I am not a huge fan of mystery series, but I do have a few exceptions. The fact that this one was centred around a female nurse, Bess Crawford, during WWI immediately caught my attention. I am a huge fan of Jacqueline Winspear's Maisie Dobbs series, so I am always looking for series of that same nature. Plus, I don't read as many books set during WWI as WWII and that is something I really need to remedy. I actually missed the first discussion for the read-along because I was doing up my Titanic posts, but I am finally taking the time to talk about this book. 1) Was this the first book that you read by Charles Todd, or, the first book set in this time period? I first encountered WWI-era-England with Jacqueline Winspear's Maisie Dobbs series, and then, of course with the tv sensation Downton Abbey. If you have read more in this time period, what other books do you recommend? 2) What was your first impression of Bess Crawford? Were you surprised by the independence she enjoyed as a woman in this time, and that her parents afforded her so much freedom? Did your opinion of Bess change throughout the novel? - I actually think as far as her independence goes, she is probably more realistic than Maisie Dobb's. Her parents are constantly checking up on Bess and there is Simon, a friend of the family, who is around the rest of the time. She still does move around a fair bit, but not without some restrictions. I also think that her being a nurse in WWI and the changes that brought for women opened up some of the freedom for her. As to my first impression, I wasn't sure what to make of Bess. I enjoy the setting and all that, but I am not so sure about Bess herself. I don't dislike her, but she is not my favourite literary character ever. There is just something about her that is keeping her at a distance (and I have read two books in the series at this point). 3) Bess has an interesting back story, growing up as she did in India. How did the authors use that part of her life to help define her character, and that of her parents and their relationship? 4) Did you know that large ocean liners, such as the Brittanic, which was a sister ship to both the Titanic and the Olympic, were called into service as hospital ships during the war? Brittanic was indeed sunk as well, just as the Todds write it in the book. Did you know that so many of the men who died on the hospital ships were buried at sea? Of course it makes sense, but I hadn't realized the number and that those men's families were left with no grave at home to visit, as Bess reflects, "In the sea there were no markers for the dead. No place in the deep to mourn, no place to leave flowers." -I have always been fascinated with the Titanic, but with that comes interest in the sister ships. The Olympic was also used as a hospital ship during the war and there is a historical picture of it docked at the Halifax Harbour. I think this might be the first fictional book, though, that contained the Britannic. That I have read anyway. How quickly the ship sank considering all the modifications that were made to it following the Titanic surprised me the most each time I read about it. It just goes to show there is no such think as an 'unsinkable' ship. I was not surprised about the bodies buried at sea. That was something that was just done even if it wasn't an incident during the war. It is just the naval way. 4) What did you think of Arthur's message? Do you think it was fair of him to ask Bess to deliver it? Why do you think she was so committed to not only delivering it, but to making sure it was followed by the Graham family? -I was a little surprised by the message in the beginning. You find out about it early in the novel and I wasn't sure what to expect. We still didn't really know Bess, so it was hard to entirely say how she would handle things. I thought it was nice that she made sure the message was delivered, but I was a bit surprised by how obsessed she was about things. Obviously if she hadn't the book would be rather short, but I think it might be her need to get wrapped up in other people's affairs that is making her so hard to grow on me. I am not entirely sure if it is believable. 5) What did you think of Mrs. Graham and her sons? I was struck by how much Bess was at their mercy and whim while staying in their house. Do you think they abused her kind nature in asking her to care for Peregrine? - I couldn't get over the Graham family. Arthur seemed so normal, but wow, when you get into things there is a lot going on there. I went back and forth on Mrs. Graham. I sometimes was very sympathetic about her, but then there were other times where I just didn't like her at all. Her sons were no different, but I think I knew more clearly how I felt about them when everything played out. And, yes, I was both surprised by how it was well Bess was staying with them and how they treated her in regards to Peregrine. Again, I was a bit hesitant to find it believable. 6) Did you guess who the real killer was before he was revealed? I confess I went back and forth a few times, wondering. - I went back and forth, too. I would think I had it solved and then I wouldn't be so sure any more. I wasn't surprised by the ending, though. I do think the Todd's did a good job of keeping things mysterious. 7) What new word did you learn in A Duty to the Dead? For me it was "ratings," which refers to "a classification according to grade; specifically: a military or naval specialist classification, or more precisely: "chiefly British: a naval enlisted man." (Merriam Webster's Collegiate Dictionary, 11th edition). In conclusion, I do enjoy this series, but I have a few reservations about this book. 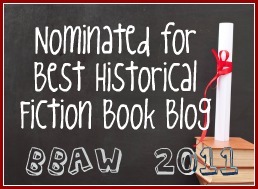 This read counts for the War Through the Generations and the Historical Fiction Reading Challenges. This post was cross-posted at The Written World. Totally new to me so I did enjoy the update on this series. Thank you for all the links. This is a series that I want to learn more about as I hadn't heard of it previously. It is good so far. I have read the second book and the third arrived in the mail a couple days ago. Have enjoyed several Todd books from their series, including A Duty to the Dead. This sounds really interesting Kelly! I think I'm going to add it to my "pile that needs to be read soon"!